Selecting the right vacuum can be quite challenging. That’s because each market segment — and facility — differs in its own unique way. Ultimately, the choice in vacuum should come down to what unique attributes each facility values. With a plethora of vacuum choices available on the market, pairing the correct vacuum type to a customer’s needs is an important selling point for jan/san distributors. This article looks at distributors’ two biggest markets: education and building service contractors who clean commercial offices. For educational institutions, tight budgets are always going to be an issue. When there is a cut in school funding, often of the first places that a school looks to tighten the purse strings is the cleaning program. As a result, cheap, less impactful cleaning products become the primary tools of the custodial staff. This misguided priority list leaves cleanliness to suffer as the tools being used are often incapable of the thorough cleaning a school requires. Rather than choosing a vacuum based solely on the up-front price tag, distributors say it’s important to look at the cost of ownership over the lifespan of a machine. For educational facilities, backpack vacuums make the most sense from a financial, productivity and indoor air quality standpoint. According to industry manufacturers, the cost of maintaining a backpack vacuum is three times less annually for common replacement items such as motors, belts, brushes and bearings, than a single motor upright. Multiply that by the seven year average lifespan of a backpack vac, and the backpack is the smarter investment — a savings of nearly $900 on maintenance costs alone. In addition to the savings on a backpack vacuum’s durability and decreased maintenance, educational facilities also want a tool that can boost worker productivity. According to industry manufacturers, a worker using a backpack vacuum can clean more than three times faster than when using a traditional commercial upright. When using a cordless backpack, the cleaning times are five times faster. 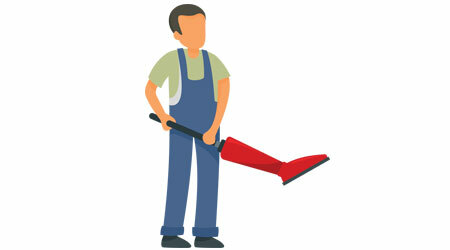 This time savings allows the reallocation of custodians to other problem areas in the facility. When comparing the use of a backpack versus a single motor 14-inch upright in a 100,000-square-foot facility such as a university, the labor savings when using a backpack is upwards of $85,000 annually, manufacturers say. Ensuring the vacuum will provide a clean learning environment is equally important in choosing the right product for the job. “Indoor air quality is essential when it comes to school districts,” says Darren Tharp, equipment specialist, Central Sanitary Supply, Modesto, California. According to a 2014 survey by the National Center for Education Statistics, nearly a half of the nation’s schools had poor indoor air quality that contributed to high levels of absenteeism associated with asthma and other health problems. Rigorous cleaning using modern equipment such as backpack vacuums with HEPA filters can reduce exposure to allergy and asthma triggers, cutting down student and teacher absenteeism and contributing to better learning conditions. Distributors say that backpack vacs with HEPA filters help remove allergens from carpets and hard floor surfaces. Their versatility also removes dust and dirt that collects around vents and other above-the-floor surfaces. Vacuums that are certified by the Carpet & Rug Institute (CRI) are designed to improve indoor air quality, boasting superior filtration systems that capture allergens and pollutants, won’t stir up or blow dust and other contaminants back into the air, reducing the need to dust as often. Also important in a vacuum cleaner is its ability to clean a variety of surfaces, crevices and maneuver in tight spaces, says James Smith, executive vice president of HP Products in Indianapolis. While a wide-area vacuum makes more sense for large open spaces, backpacks can get in and around chairs and other tight spaces quickly.